Heat Pump Market size in 2018 was valued over USD 44 billion and the annual installation is projected to exceed 14 million units by 2025. Emerging demand for cost effective, reliable and energy efficient heating solutions to reduce electricity consumption across residential, industrial and commercial embodiments will propel the market share. For instance, ground source heat pump has ability to reduce the electricity consumption from 30% to 70% in heating mode and 20% to 50% in cooling mode in comparison to conventional heating systems. Rapid industrialization along with rising awareness toward the effective utilization of energy efficient technologies are propelling the demand for energy efficient systems. In addition, incentives including direct grants, renewable heat incentives, financial assistances, tax rebate and zero interest rate loans are introduced by policymakers to promote the adoption of sustainable technologies. Rising concerns over reducing the carbon emissions from fossil fuel driven systems along with growing focus toward energy conservation will drive the market size. Regulators have introduced several norms and directives to achieve renewable targets and thereby reduce greenhouse gas emissions. For instance, the policymakers across the Germany have set a target to minimize carbon emissions by 270 MMT by 2020, through promoting the renewable energy utilization. Surging demand for sustainable space conditioning systems for providing heating and cooling solutions across establishments will fuel the ground source heat pump market growth. Minimized heat transfer loss, low installation and O&M cost are key underlined parameters enhancing the product adoption. The product ability to extract heat from ground by circulating antifreeze solution through buried pipe will make it preferable option over other alternates. Air source heat pump market is set to grow 4% by 2025. Limited space requirements, zero expense for ground work and cost effectiveness are some of the key features propelling the product demand. These system helps to minimize GHG emissions up to 40% when compared with conventional HVAC systems. Ongoing technological innovation in the designing of heat pump to improve efficiency will further complement the product deployment. For instance, in 2017, Stiebel Eltron introduced WPL, an indoor air/water series for heating and cooling with power control. The product ensures low acoustic emissions and offers high efficiency inverter technology for low energy consumption. 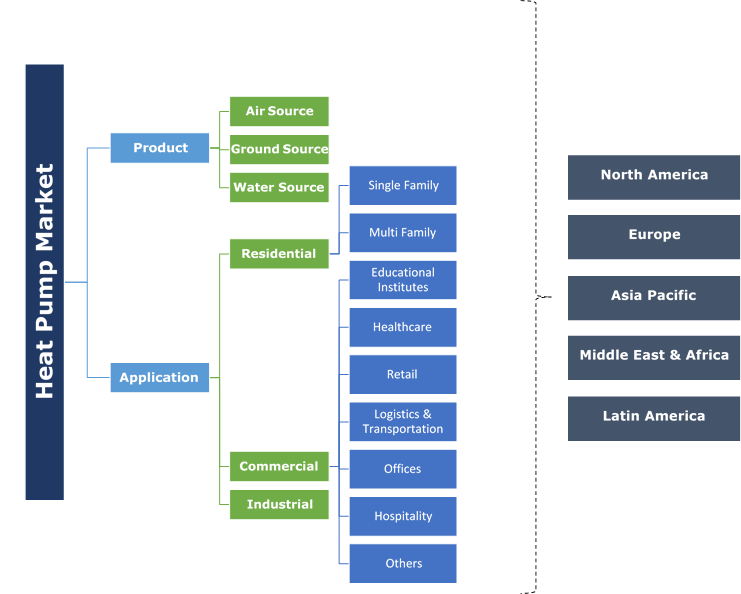 Residential heat pump market will grow subject to growing investment toward the refurbishment and re-establishment of buildings along with increasing purchasing power parity. Ability to easily integrate with conventional units across existing and new constructed establishments make its adoption preferable over other alternates. Furthermore, shifting trends to improve living standards coupled with rising awareness toward reduction of energy bills will further complement the industry dynamics. Commercial installations in 2018, accounted for over 14% of global market share. Growing investments from private and public financial institutions to upgrade the existing infrastructure will stimulate the industry growth. Introduction of several standards and codes toward green building infrastructure to reduce carbon emissions, enhancing the utilization of renewable technologies will further augment the business landscape. Finland market will grow on account of growing demand for cooling and heating solutions across residential and commercial establishments along with improving living standards. In 2016, according to the OECD space heating accounted for 68% of overall residential energy consumption and water heating for 15%. Increase in tax on fossil fuel coupled with growing focus to reduce import dependency are some of the imperative parameters positively influencing the product demand. The U.S. heat pump industry is set to surpass an annual installation of 4 million units by 2025. Growing investment toward multi and single housing buildings supported by rapid urbanization and strengthening purchasing power will fuel the industry dynamics. Furthermore, growing focus to minimize carbon emissions along with availability of constant ground temperature primarily in Wilkes/Scranton -Barre areas will further complement the business growth. 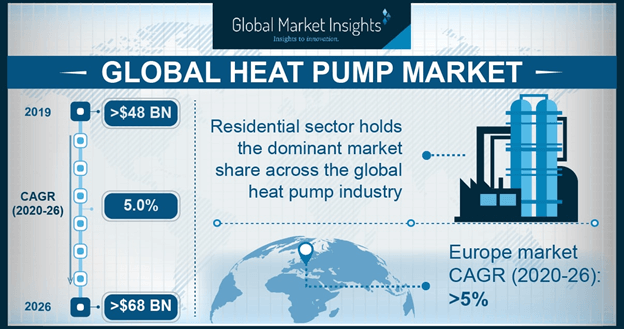 Notable industry participants operating across heat pump market comprise Trane, Vaillant, Green Planet Supply Technologies, Glen Dimplex, Viessmann, Earthlinked Technologies, Stiebel Eltron, Bard HVAC, Bosch Thermotechnology, Danfoss, Modine, Daikin, NIBE, Carrier, Bryant Heating & Cooling, OCHSNER Warmepumpen, Mitsubishi Electric, Nortek, Wolf, Weishaupt, Finn Geotherm, Kensa Heat Pumps, Swegon, Thermic Energy and Solarbayer. Several inorganic growth ventures aimed at the expansion of global footprint and enhancement of customer portfolio are being witnessed in the industry. For instance, in 2016, Modine Manufacturing acquired Luvata Heat Transfer Solutions to enhance its manufacturing capabilities & product portfolio across the globe. Heat pump is an energy efficient system that moves heat from one place to another by circulating refrigerants through evaporation and condensation. They are categorized by ground, air and water. It is suitable for heating and cooling application across residential, commercial and industrial establishments. Low running cost, longer lifespan, fewer emissions, energy saving and less maintenance requirements are some of the prominent features, which will boost the product demand.